Outdoor Landscape Lighting - The shortest days and longest nights of the year are here. How are You going to see in the dark? 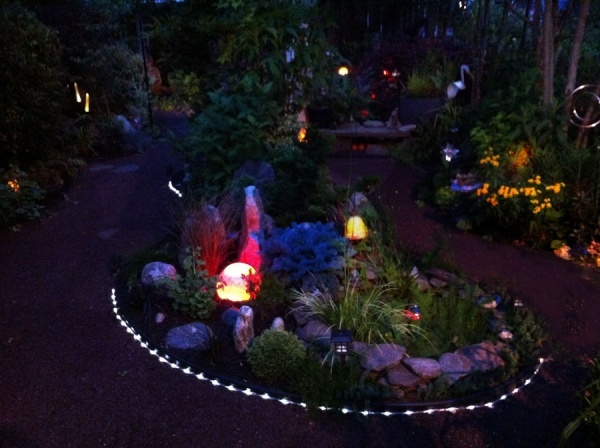 Over the past season I have been doing an informal study on solar lighting for gardens and landscapes. The idea of having a sustainable light source that uses no exterior energy source sounds good but according to my findings solar lights are just not ready yet as a viable outdoor lighting source. In the spring I had purchased a number of different types of solar lights made by different companies, some cheap and some expensive to test out myself so that I could recommend them in my landscape designs and consulting to my friends and clients equally to or instead of low voltage electric lighting. I already had a low-voltage lighting system that I had designed, built, and installed to great effect but I wanted to see if the promise of an off the grid system was feasible for both decorative and functional purposes. The function of a solar light is to gather energy from the sun, temporarily store that energy, and then use that energy to power a light bulb that night. A solar light has a solar panel that gathers the sunlight during the day that is turned into energy and stored in batteries and then that stored energy is used as the energy source by the light bulb that same night. The advantage of landscape low voltage lighting is that you can put them anywhere, as long as you can burry the wires for them, and have them on a timer to turn off and on at will; you can even have different zones lighted up at different times on the property. The promise of solar lighting is a bit different. Theoretically you can put them anywhere in the landscape and you don’t have to worry about the wiring but you have to consider that they will only work in areas that receive sunlight. Currently they turn themselves on as soon as it is dark enough and will last as long as the battery has a charge in it, which typically are only a few hours. They must have direct sunlight during most of the day in order for them to work that night. They can’t be placed in shady areas and on cloudy days, and especially on rainy days they will not work that night at all limiting their functionality. Additionally the amount or brightness of the light that they put out is far too low to be considered functional in most applications. Typically you can only see the light itself instead of what it is lighting. It’s like the difference between a 6-watt nightlight compared to a 75-watt reading light. This is a real problem if you need a light or lights to see your driveway or your walkways, which can make it an unsafe area especially in a high traffic area or on the properties of senior citizens. As a result of the shortness, brightness, and amount of needed sunlight I would not recommend them at all for functional lighting in which the need for light is a requirement especially in a safety situation. However as a decorative light they can be charming. If all you need is a bit of detail or color in your darkened landscape for a few hours after dark they are decent. I would say that the only real use for solar lighting at this point is for decorative purposes. A number of attractive lights are available in a number of different colors from most large hardware stores or garden centers. They can be added to a large planter for some color or in a “black hole” in the nightscape. Or they can be grouped together ornamentally in the garden for an interesting effect. The imagination is the limit – also so is the amount of sunlight it gets during the day. I still would recommend low voltage lighting for this purpose at this point in time. The solar light technology is just not ready for usage in the different applications. There might be some company that is making a better product but I have yet to see or hear about it. If that does happen and the technology makes a useful advancement then I will post that information. One possibility is that for those that have a solar panel system on their roofs in order to get them off the power grid somewhat then you could tie the outdoor landscape lights into that source but you would still have to use a low voltage lighting system to make use of the stored energy. Now that I have used the solar lights for a full season and have personally seen their shortcomings and issues I am planning on converting all of my favorite solar lights into low voltage lighting for next year. So in conclusion I would not recommend solar lighting at all for safety or functional purposes and still would not use them for decorative lighting myself – too limiting. I’m Stephen Coan, I exclusively provide landscape design, garden design, plant lists, consulting, and project management services for public, residential, commercial, and wildlife habitat projects using sustainable green practices with a combination of native and ornamental plant species that are site appropriate for the conditions. 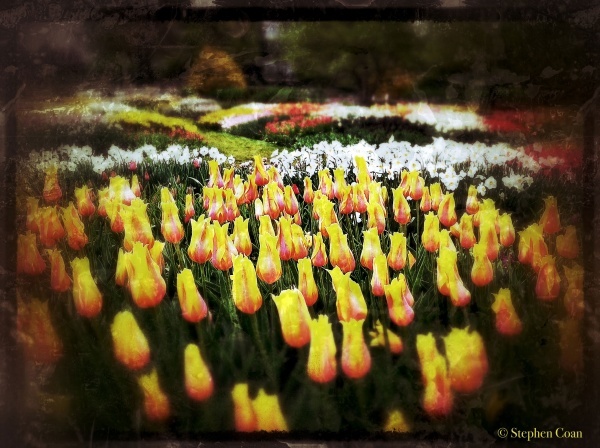 In case you haven't done so already, now is the time to plant those spring flowering bulbs. The best time is usually after Thanksgiving when the soil temperature is at or below 45º. In doing so, the newly planted bulb will not put any of its stored energy into producing any green foliage, but instead will only produce some roots if it chooses to start to grow while the temperatures aren't too low. If bulbs are planted sooner while the soil temperature is warmer, they have a strong chance of using some of their precious stored energy producing some foliage that will die off from the cold temperatures before there is enough time to produce flowers for reproduction. Then, in the spring, when the temp rises and it begins to grow, there is that much less stored energy for the bulb to produce its roots, foliage, and flower, which can result in a smaller or a less healthy plant that growing season. Please read the instructions as to the proper planting depth for your type of bulb and don't forget to use some of that good compost that you made this year. 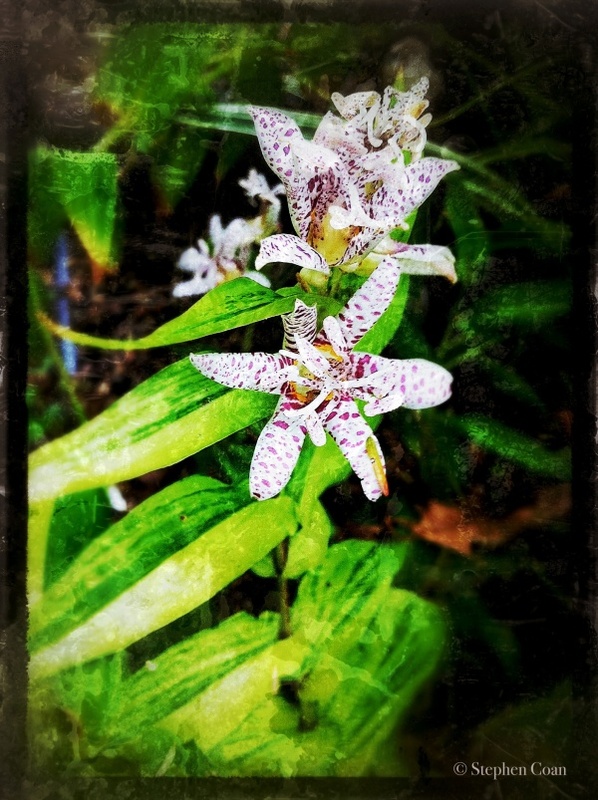 Toad Lilies make a great, late-season, blooming landscape design plant choice. 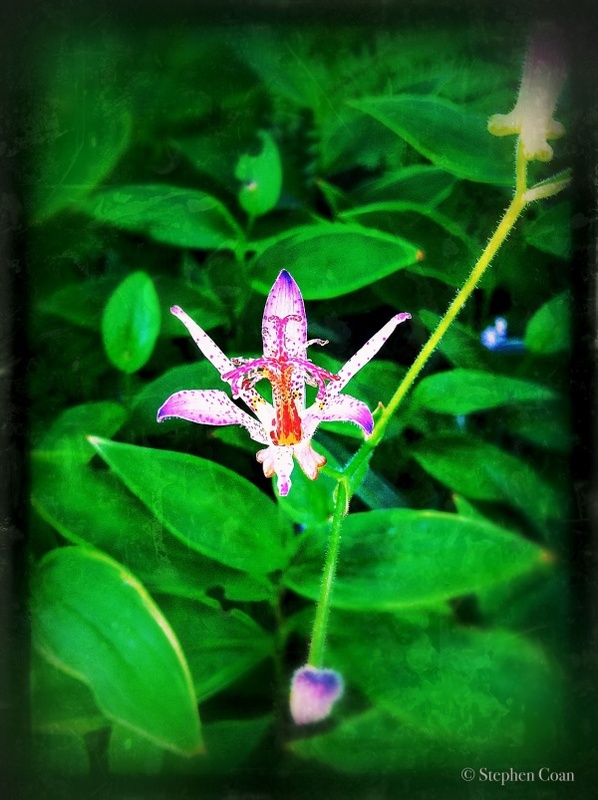 This group of perennial plants, genus Tricyrtis, produces a very long season of blooming, starting in the late summer, that can last into December depending on species, form, variety, or cultivar. 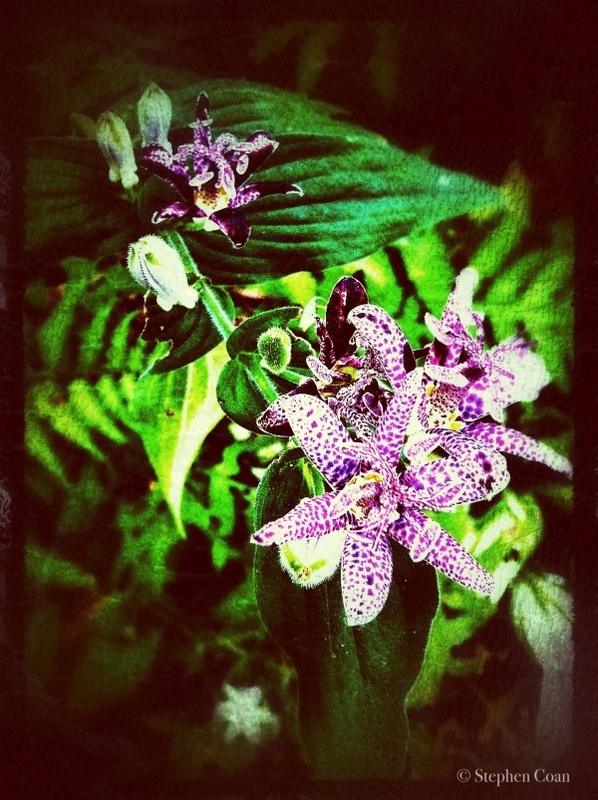 It produces many small, orchid-like flowers, either along the entire stem or at the end of the stem, and can have either solid or variegated leaves, again depending upon the type in green, white, or yellow/chartreuse. 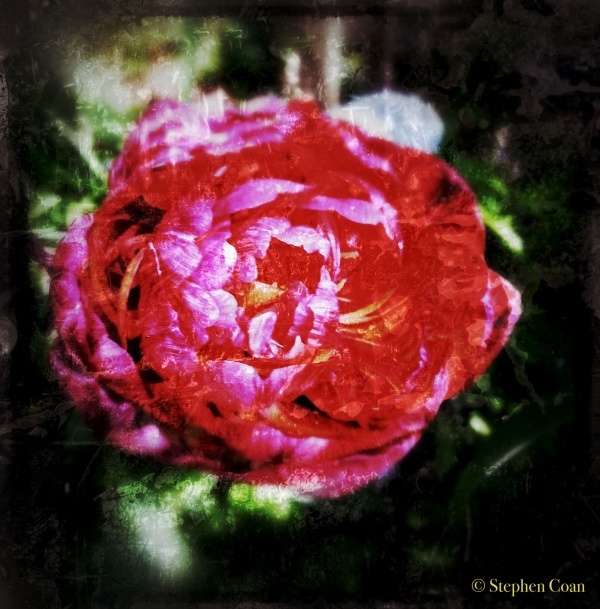 As a landscape designer, this is my favorite perennial shade plant. They can take some sun, but usually not full sun, and do quite well in open shade. 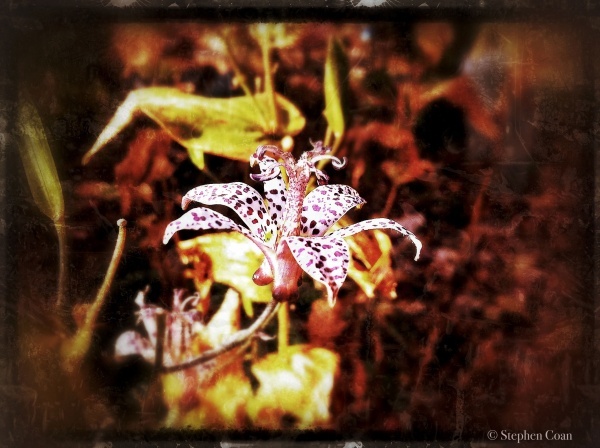 I have many different types and am always on the lookout for new or unusual ones. 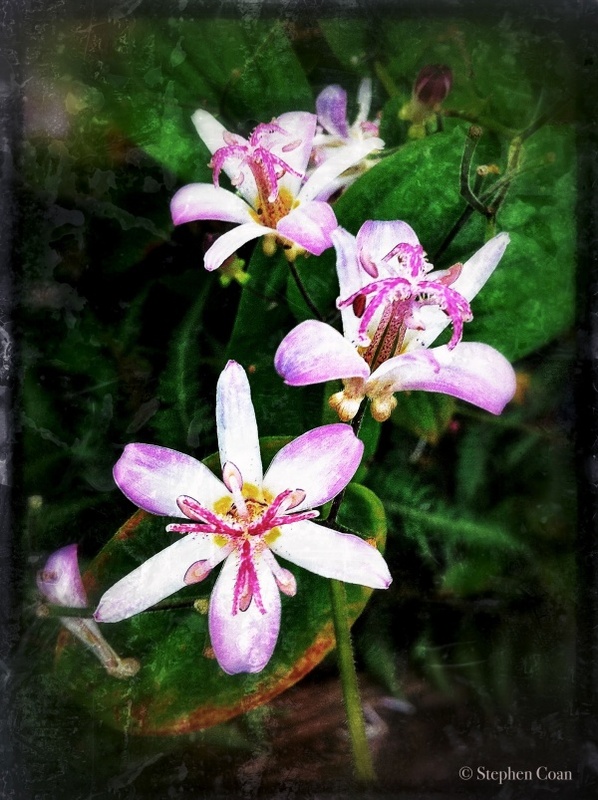 They are best planted near a walkway, patio, or, for the smaller ones, in a container to better see and appreciate the details of the small flowers. 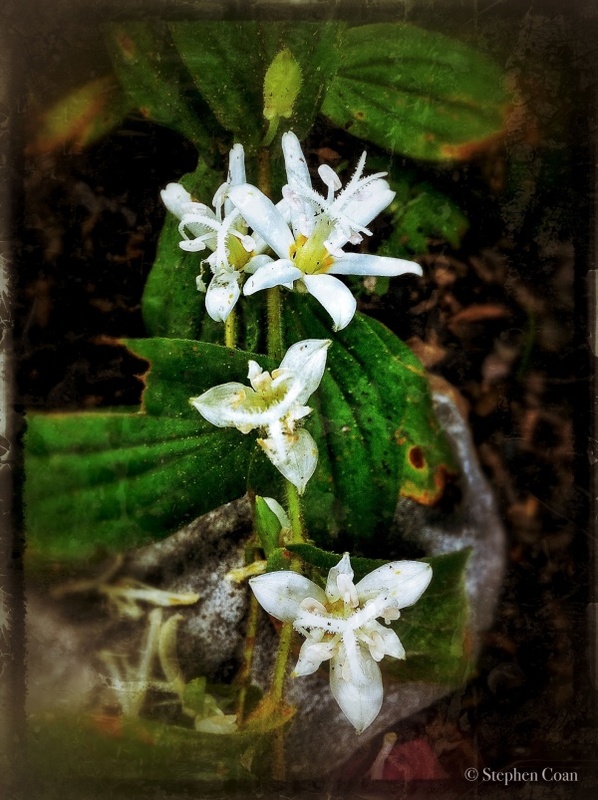 As of December 5, 2012, I have three different Toads that are still blooming. Most have already finished for the season. Sizes: varies from 6" to 4' tall; some can spread out into a 3' wide patch over time. Found in: better garden centers and nurseries. T. 'Samurai' a variegated cultivar with yellow edges on the leaves.